As I’ve repeatedly explained, governments generally get in fiscal trouble because politicians can’t resist spending lots of money when the economy is buoyant and therefore generating lots of tax revenue. And this is why I’m a huge fan of spending caps. If outlays can’t grow faster than, say, 3 percent annually, that make it difficult for politicians to enact unsustainable spending commitments (as we’ve seen in Greece, Alberta, Puerto Rico, California, and Alaska) in years when there is extra revenue. Now I have a new example, and it’s extra painful because the politicians literally want me to pay for their profligacy. Here’s part of what was recently written in the Washington Post about the supposed budget hardships in my home county of Fairfax in Virginia. Virginia’s largest municipality is fraying around the edges. A population that is growing older, poorer and more diverse is sharpening the need for basic services…even as a sluggish local economy maintains a chokehold on the revenue stream. Since the 2008 recession, local officials have whittled away at programs to the tune of $300 million. …Since 2008, the county has eliminated 700 jobs. Libraries operate on shorter schedules and with fewer books, class sizes have swelled past 32 students in some schools… County agencies are stretching out vehicle maintenance — including for school buses and fire engines — and officials say aging athletic courts and deteriorating playgrounds await nearly $20 million in repairs. …The county slashed $3.8 million in summer school funding in 2015 and is trying to use $374,000 less in paper this year. But all this budget “slashing” apparently isn’t enough to balance the budget. …there is no fat left to trim. Instead, they are searching for ways to raise taxes… The county is searching for new revenue to cover some of what officials estimate are hundreds of millions of dollars worth of unmet needs. …“We’ve been punting for seven years now,” said John C. Cook (R-Braddock), a county supervisor. “There’s really nothing easy left to cut.” …the County Board of Supervisors will decide whether to raise residential property taxes by as much as four cents — to $1.13 per $100 of assessed value. Gee, sounds like the government has “cut spending to the bone” and imposed “savage austerity,” which means higher taxes are the only option, right? Not exactly, Professor Don Boudreaux of George Mason University digs through the data and exposes the truth. What budget cuts? In fiscal year 2016 Fairfax County’s government will spend $7.13 billion dollars – the highest inflation-adjusted annual expenditure in County history. And this real expenditure is the highest in County history even on a per-capita basis. 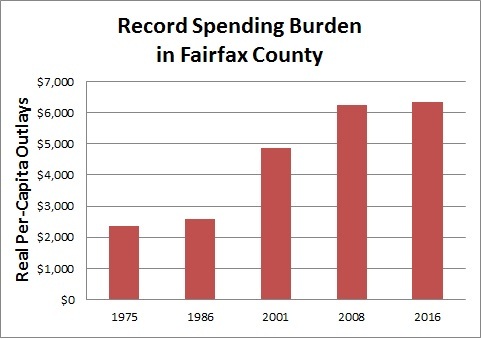 …Fairfax County’s government today spends, per county resident, 168 percent more real dollars than it spent in 1975, 144 percent more than in 1986, 30 percent more than in 2001, and 1.6 percent more than in 2008 – the year that your reporter suggests marks the beginning of Fairfax County’s budget austerity. …it is emphatically not true that the Fairfax leviathan has cut its spending or suffered budget cuts. Quite the opposite. Don included a table of data, which I’ve put into a chart. Remember, this is inflation-adjusted spending, and also per-capita-adjusted spending, which means we can do apples-to-apples comparisons. And the comparison that really matters is that the local government is now spending more than twice as much as it did 30 years ago. Are the schools more than twice as good? No. Are the roads more than twice as good? No. Are the parks more than twice as good? No. So where did all the money go? Beats me, though I’m going to take a wild guess that the country bureaucracy is now far bigger and getting paid much more. In other words, the same theorem of government that explains the behavior of Washington also applies at the local level. P.S. Let’s close with a very appropriate joke about the type of people who create fiscal crises. And so it happened. His sons became a doctor, a lawyer, and a financial planner, each very successful financially. When their father’s time had come and they saw their father in the coffin, they remembered his wish. First, it was the doctor who put 10 $100 bills onto the chest of the deceased. Finally, it was the heartbroken lawyer’s turn.He dipped into his pocket, took out his checkbook, wrote a check for $3,000, put it into his father’s coffin, and took the $2,000 cash. If you want more jokes about politicians, click here. When we pay one hundred percent tax, we will have civilized completely. PS. Any jurisdiction where government expenditures rise faster than the growth rate is doomed in the long term. But, of course, the voter-lemming votes today, not in the long term.